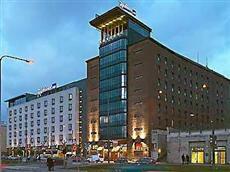 The Radisson Seaside is nestled away in the rapidly growing Ruoholahti business district, right by the sea. Most of the popular highlights, such as the exclusive shopping streets known as Bulevardi, can easily be accessed from this Helsinki hotel. Helsinki-Vantaa International Airport is only 30 minutes from the Radisson Seaside Helsinki, and the West Terminal sea port is within walking distance of the hotel. Guests driving to the hotel can make use of its garage. A number of beautifully appointed guestrooms are available in the Radisson Seaside Hotel. Each room is decorated in a modern style and comes equipped with satellite TV, a mini-bar, and a direct-dial telephone. The Radisson Sas Seaside is the first hotel in Helsinki to be given the Nordic Swan Label for its environmental consciousness. Guests can start their day off each morning with a seaside-style breakfast in the breakfast room, and enjoy international and Finnish specialties later in the day in the on-site restaurant. A total of 12 flexible conference rooms are available should business travelers wish to hold a meeting during their stay. After an exhausting day of work or sightseeing, guests can relax in one of the hotel’s 3 saunas.